Professor Zakri is also Chairman of the National Science and Research Council (NSRC) and Joint Secretary of the Global Science and Innovation Advisory Council (GSIAC) chaired by the Prime Minister. Professor Zakri has held several international leadership roles such as, member of the UN Secretary-General’s Scientific Advisory Board and the founding Chair of the newly established UN Intergovernmental Science-Policy Platform on Biodiversity and Ecosystem Services (IPBES), member of the New York Academy of Sciences (NYAS) President’s Council ,member of the Science for Society (STS) Forum in Kyoto. He also sits on the Global Leadership Council of the Sustainable Development Solutions Network (SDSN), an initiative of UN Secretary-General Ban Ki-moon and led by economist Jeffry Sachs of Columbia University.Professor Zakri was recently awarded one of the world’s most prestigious environment prizes, the Zayed International Prize for the Environment 2014 in recognition of his international-level achievements. Furthermore, he is a member of the Board of Directors of the Institute for Global Environmental Studies (IGES) in Japan. 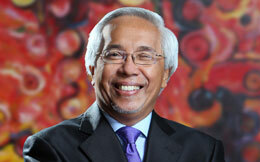 Professor Zakri previously was the Director, Institute of Advanced Studies, United Nations University (UNU-IAS) (2001 – 08). He Co-Chaired the Millennium Ecosystem Assessment Board (2001-05), a four-year U.N. study undertaken by 1,360 experts from 95 countries to assess the state-of-health of the world’s ecosystems. He was also the Vice-President of the Academy of Sciences of the Developing World (TWAS); member of the Arab Fund Fellowship Program, member of the IAEA Senior Advisory Group on Technical Assistance and Cooperation and member of the ICSU Executive Board. Prof Zakri served as the Secretary General of the Society for the Advancement of Breeding Researches in Asia and Oceania (SABRAO) from 1981-89 and was Deputy Vice-Chancellor of Universiti Kebangsaan Malaysia from 1992-2000. He was the Founding President (1994-2000) of the Genetics Society of Malaysia. Trained in genetics and plant breeding (PhD from Michigan State University (1976), In addition, Professor Zakri was the recipient of a Fulbright-Hays Fellowship (1981), a Gold Medal Award from the Rotary Research Foundation (1999), an honorary doctorate of science from Universiti Malaysia Terengganu (2013), an honorary doctorate in biotechnology from Universiti Sultan Zainal Abidin (UNISZA) (2013) and the Matsuda Award from the International Society for Southeast Asian Agricultural Sciences (ISSAAS) (2013). Finally, Professor Zakri is a Fellow of: the Academy of Sciences Malaysia (1995), the Academy of Sciences of the Developing World (TWAS) (1996), the World Academy of Art and Science (2003) and the Islamic World Academy of Sciences (2006). In 1998, Professor Zakri received the Langkawi Award, a national laureate for outstanding contribution in the field of environment in Malaysia. Interestingly, three species known to science are named after him: a beetle (Paleosepharia zakrii); a cicada (Pomponia zakrii), and a pitcher plant (Nepenthes zakriana). A conversation with GFCC Global Fellows on the next steps for promoting the Call to Action.